In 2018, the university of Salamanca celebrates its 800th anniversary, an event not only of Castilian or Spanish importance, but with world-wide reverberations. From the beginning of the 16th century until the 18th century, the so-called School of Salamanca shaped the juridical-political discourse and language of the two great Iberian empires, with its characteristic intertwining of science, jurisprudence, religion, and politics. Theology, philosophy, jurisprudence, natural sciences owe substantial innovations to this group of Spanish, Portuguese and American thinkers whose impact was never limited by frontiers of countries, continents, or religious denominations. In East and West traces of their thinking and teaching can be found. Universities followed the Salmantine curriculum; in America and Asia, texts from Salamanca were studied, excerpted, copied, and new works were written, based on the principles, content and scientific practices of this school. Without the American and Asian experiences and voices, modern jurisprudence, philosophy and theology, as we know them, would not exist. For a long time, this world-wide significance of the school of Salamanca was understood as a phenomenon of the reception, in which the American and Asian actors appeared only as passive recipients of European knowledge and normativity. However, processes of global interactions are brought into focus by recent researches in the fields of legal history, philosophy, and history of knowledge. “Salamanca“ thus becomes a point of intersection in a world-encompassing network of normative knowledge production. Normative systems which had deep roots in European history and traditions were replicated, complemented, changed, and adapted to local needs – and then reflected back to Spain, to Europe. In the American context, the production of knowledge had to face new challenges: the encounter with hitherto unknown peoples and religions, the geographical distance to Europe and the enormous dimension of the American continent itself were only a few of them. Such external factors enabled and forced Spanish and Portuguese jurists, theologians, and philosophers to leave the well-trodden paths of medieval tradition and to find new answers for the new questions of a new time. Authors, books, and ideas then found their way back to Europe, into the lecture halls of the universities as well as into the session chambers of political bodies. The discourse about a law of nations and universal human rights began in the so-called School of Salamanca and is only the best-known example for the fundamental role the American experiences played in the development of a modern Europe. 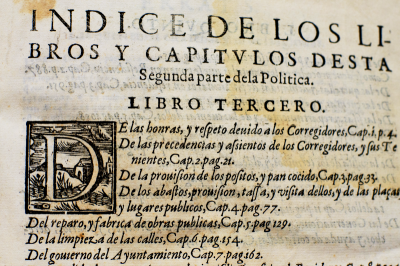 The Conference shall provide an opportunity to reflect about how this normative knowledge was produced, with an especial attention on the American parts of the Iberian monarchies of the 16-18th centuries: in university lectures and writings, but also in political and/or juridical decisions. What was the institutional framework of knowledge production, and how did it influence the results? How to analyze the process of knowledge production under the perspectives of cultural translation and textuality? – Such questions can only be answered on a broad fundament of microhistorical studies of actors, practices, knowledge reservoirs, and institutions. As a result, we may expect a new, richly shaded image of the School of Salamanca’s global significance. 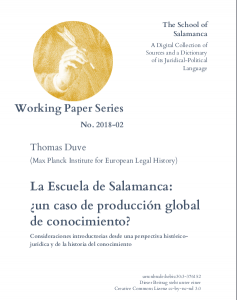 In preparation for the discussions and the conference, Thomas Duve has presented some ideas in his working paper “La Escuela de Salamanca: ¿un caso de producción global de conocimiento?“, SvSal WP No. 2018-02. For a long time, the School of Salamanca has been regarded as a Spanish, Iberian, or European phenomenon. Again and again it’s projection from Salamanca into the world, to America and Asia, has been stressed. But is this perspective really appropriate for an analysis of the indisputably important role the School played in the development of a juridical-political language? Are we not rather confronted with a case of global knowledge production which is better understood with the methods of History of Knowledge than with those of the History of Science? These questions seem even more pertinent considering that the School of Salamanca was not only a group of learned discussions, but also a community of pragmatic norm production. This working paper offers a few thoughts about these questions which are meant to serve as a basis for discussion at a conference dedicated to this topic in October 2018 and also as a preparation for the chapters of a book on the School of Salamanca as a phenomen of global knowledge production. Ideally located in the writer’s position of the voice “contractus (& quasi contractus)” of the Dictionary, the author of this paper tries to discover the difficulties that his drafting could imply. The difficulties encountered come mainly from the chronology and the diversity of profiles between the members of the Salamanca School that deal with contracts, from the unusual historical and material extension of the elements they work with and from the need to understand their methods, their initial assumptions and the aims they pursue. At the end, some practical considerations are offered to the voice’s drafting.